We work hard so you don't have to! Some lawn and landscape companies will nickel and dime you to death. We don't! We set a price, do the work, exceed your expectations, and make happy customers. You can feel at ease, take your weekends off again, and relax when you hire Thomason Lawn Care, TLC, to get the job done. Straight lines, curved borders, clean crisp edges, simple yet elegant are just a few words to describe the perfection we use when installing landscapes. From dirty fall leaf clean up to meticulous gardening, we have options to serve you best. We strive for perfection in everything we do. I would highly recommend this business to family, friends, or co-workers and can't wait to use them again! I couldn't believe that my yard can look like a golf course! 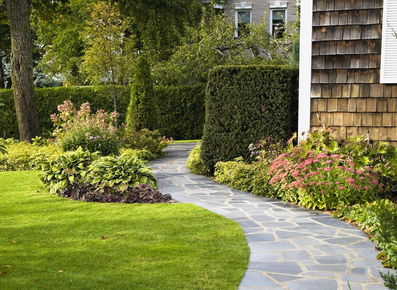 Choose a customized plan to fit your budget and your size yard to maintain a beautiful yard. We typically include edging and weed eating with every mow service. We strive to be pickier than our customers! We can design a beautiful scape of your choosing to work within any budget. We plant trees, shrubs, flowers, mulch, rock or wood boarders and more. The sky is the limit with what we can do on the ground. This includes the basic trimming of unwanted limbs to cutting down entire trees. We grind stumps, clean up, haul off and more. We are the experts when it comes to trees! Basically, anything to do with grounds maintenance or setup, including but not limited to; sod, dirt work, lawn leveling, french drains, and sprinkler system installation or repair, and more. During the off season we offer a vast array of services to our loyal customers. We do roofing, remodeling, concrete, painting, junk haul off, moving, handy man services, snow removal, salt icy paved ways, and more.